Holy mackeral (er, halibut) this was delicious. 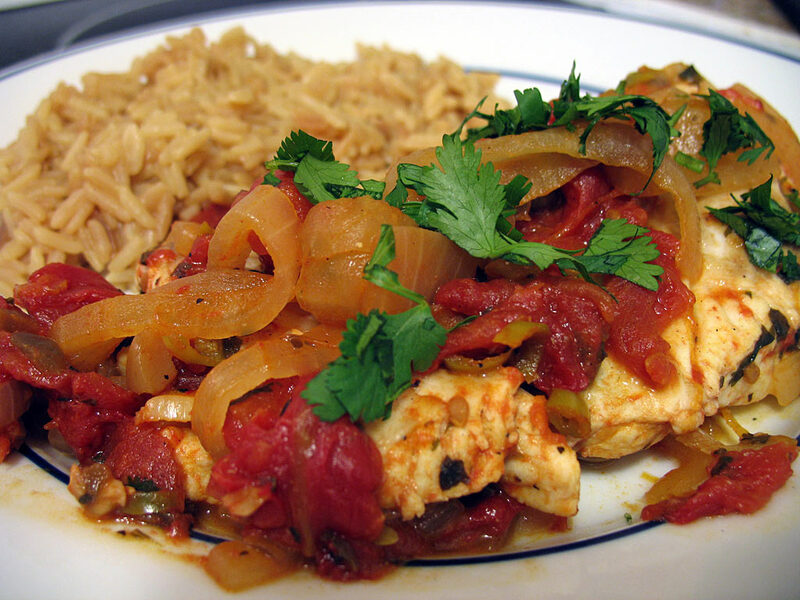 This fish recipe comes from Healthy Latin Cooking. The book calls for snapper, but we opted for halibut instead. The sauce, which you cook while the fish marinates in lime juice, includes tomatoes, onions, garlic, capers, olives, and a bunch of good spices. Once the sauce thickens, you add the fish to the pan and cook until done, about 4 minutes on each side. We served rice pilaf as an accompaniment. This entry was posted on Sunday, May 6th, 2007 at 8:09 pm	and is filed under Healthy Latin Cooking, Latin, Main Dishes. You can follow any responses to this entry through the RSS 2.0 feed. You can leave a response, or trackback from your own site.